I like the original Peripera Peri's Ink a lot, so I had high hopes for this one. 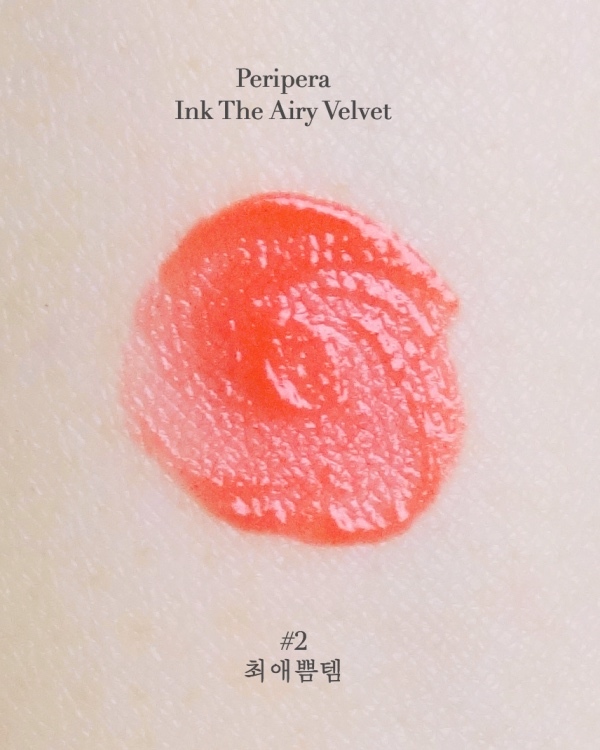 I haven't tried Peri's Ink The Velvet (Peripera's another lip tint with full-on matte finish), but supposedly "Ink The Airy Velvet" is a lighter, easier-to-wear version of it. Unfortunately, I am not a big fan. 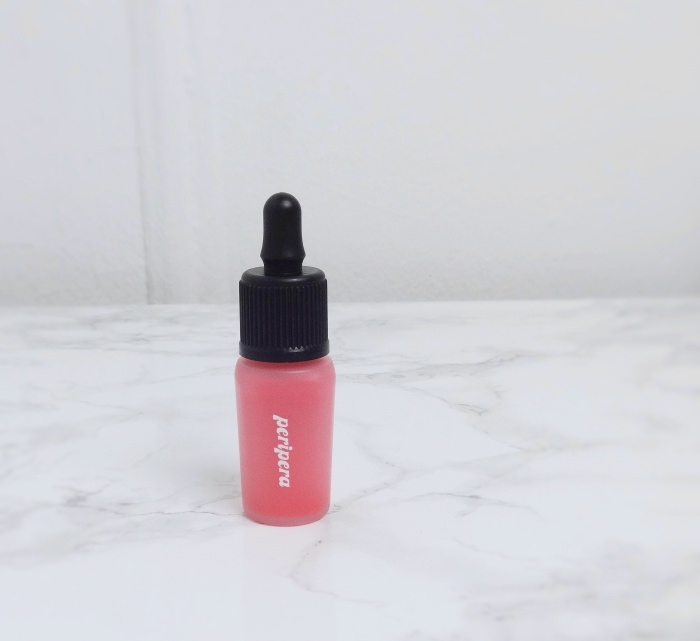 Peripera Ink The Airy Velvet ($5.96 on YesStyle) is housed in the same simple packaging but with a frosty plastic bottle. Peripera's Ink series is so popular that the brand has introduced many novelty varieties such as this, though. It comes with an angled doe foot applicator which I find convenient to use. I already own several hot pink (the default in lip lint), so I decided to pick up a warmer color this time. #2 is a reddish coral that is quite pretty. Almost every Korean makeup color has a fun (& somewhat weird) name and this is not an exception - "최애쁨템" is a compressed word for "the most favored and prettiest item", but the official English name is simply "pretty orange pink". These are not "full-on" lip swatches. Like I always do with tints, I applied a small amount, distributed the color evenly, wait a bit, and blotted off whatever was still left after the color set. True, a warm coral is not a shade I easily pull off, but #2 has enough pink and looks fine on me. I have issues with how it sets initially and feels on me later, though. 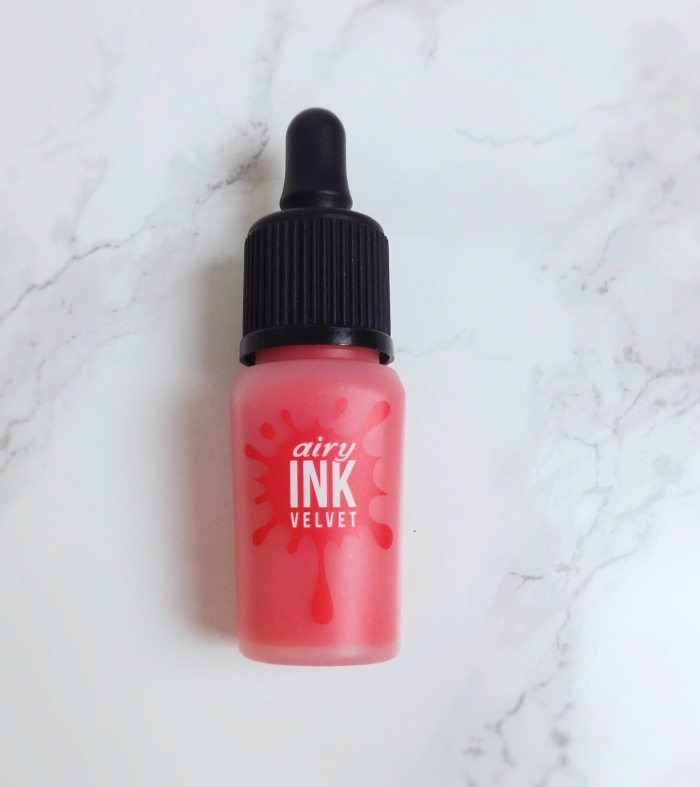 This version of lip tint is scented with an outdated floral (different from the original Peri's Ink) and feels greasy upon application. This slippery sensation lasts longer than I like and I don't feel the color sets properly even after taking a few moments. After some rubbing and blotting, the finish is finally somewhat desirable, but then there comes this drying parching sensation. The original Peri's Ink is quite drying as well but it is super long lasting and I can add lip balm or gloss on top. 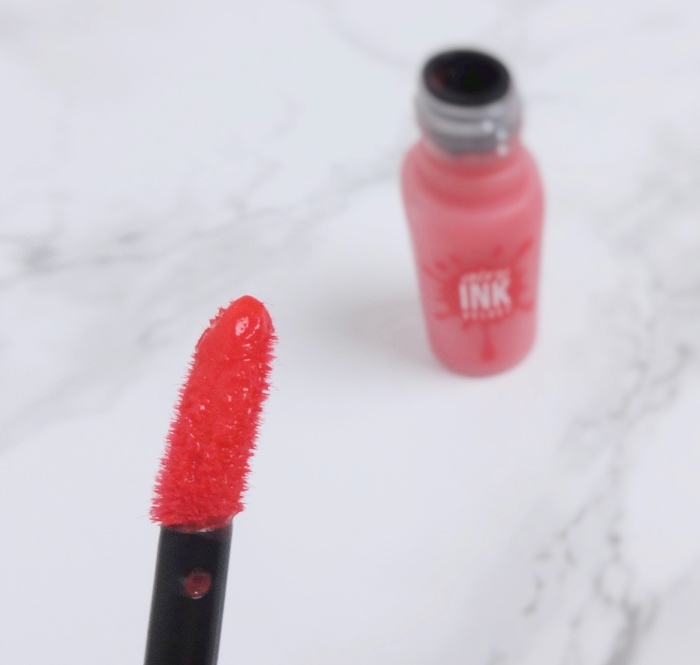 Ink The Airy Velvet isn't as long lasting, and it would be pointless to put lip gloss over something meant to be matte, wouldn't it? 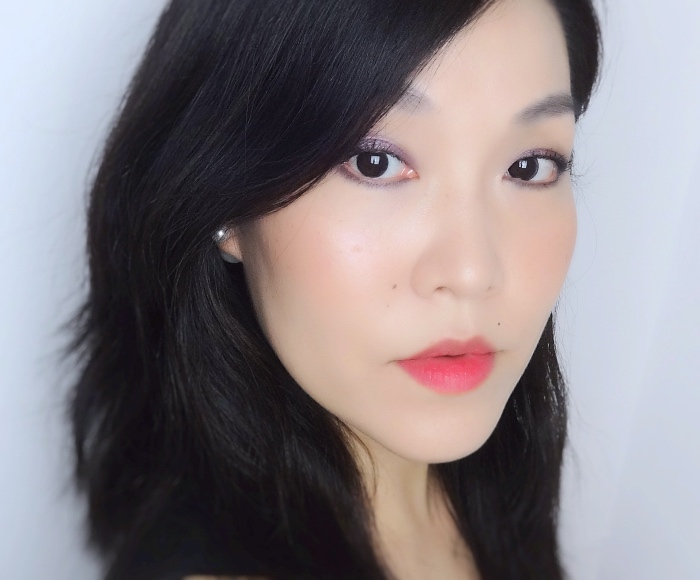 An overall look with Peripera Ink The Airy Velvet #2. I do adore the soft velvety finish but don't see myself reaching for it often. For me, something like Lancôme Matte Shaker is worth splurging if I'm in the mood for a velvety matte lip color that lasts. Hope you enjoyed this post. Happy weekend! LOL at "the most favored and prettiest item" That's so similar to how Chinese products are named :D Loses a little in translation but usually funny ;p It's too bad the wear wasn't that great but at least you have something that provides a similar effect that isn't drying. Coral shades scare me a little but I find them way less intimidating to wear if I blot them down to a sheer stain. It's a shame that the formula doesn't feel great, it looks so pretty on you! I recently bought a lip product that sounds like it would be the same frustrating combination of Not Setting ASAP-> Drying/Pilling, the Catrice Velvet Matt Lip Creams. Not a fan either of this sensation! Thanks, Mimi! I wish I found the formula a bit more tolerable, too. I also remember you had a similar complaint about that NARS set? I will stay away from the Catrice ones, then. Nowadays, formulation is as important as colors when it comes to lip stuff.